Kedrian Woodruff lost her father nearly five years ago, just a few days after she turned 13. The Canton, Miss., teen, whom her mother, Tiffany Woodruff, calls “truly a daddy’s girl,” was without her father for most of high school. Still, Kedrian wanted prom to be different. So she found a way to take him with her. 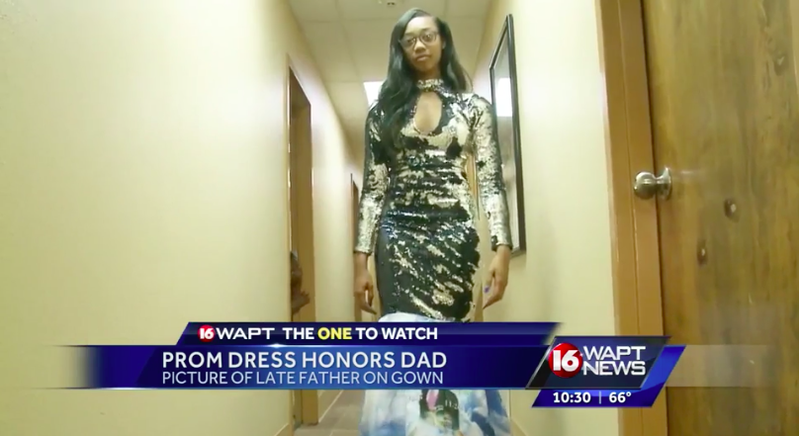 As WAPT-TV reports, Kedrian had a dress designed that would honor her father, who died during a business trip to Japan, and allow him to be with her on her prom night. “She said since he’s not here to see her go to her prom, that she wanted a prom dress with his picture on it so she can take him with her,” Tiffany Woodruff told the TV station. Kedrian opted for a sequined mermaid gown, with the train of her dress adorned with the face of her late father. “I was kind of mushy because I think it was very thoughtful of her to get her gown designed like that,” said Smith. It was exactly what Kedrian hoped for—being able to have her dad be with her during a major milestone. She says her classmates were impressed by the dress.